Every season I usually acquire a "statement bag" to add to my collection. It is the one item that I will spend an exorbitant amount of money on. Okay, not quite exorbitant. I usually stay under $800 for piece of mind. Then I increase my community service and donations to the less fortunate. It's a ritual that some of you may be familiar with. For the gents, a watch, or a nice pair of frames (i.e. Cartier), or any accessory is considered their "I have arrived" items. For me, it's the handbag. 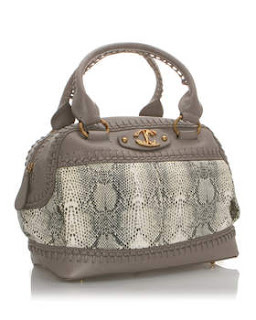 And right now I think I want to purchase this snakeskin canvas bag from the Just Cavalli collection by Roberto Cavalli. I am usually not a print person, however, I think the design of this bag is tasteful and not over the top like some of his usual creations. It's definitely a contender.